D/JX140373 Signalman Norman Fairchild, RN, HMS Ardent. 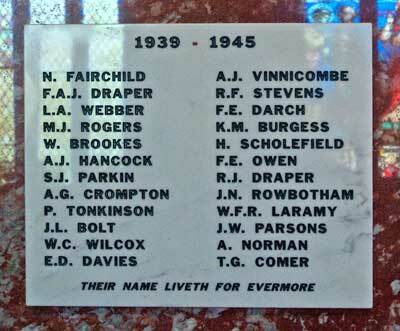 Son of Percy and Grace Fairchild of Ilfracombe. Born in Hampshire in 1918. Died 8 June 1940 aged 21. 1882316 Sapper Frederick John Draper of the Royal Engineers. Son of Frederick and Florence Draper. Born in Combe Martin in the March Quarter of 1916. Died 17 June 1940 aged 24. FAA/FX 76308 Leading Airman Leslie Arthur Webber, RN. HMS Furious if 816 Squadron, the Fleet Air Arm. Son of Albert frank and Christine R Webber; husband of Ivey Webber. Born in Essex in the September Quarter of 1914. Died 22 September 1940 aged 26. On a mission off the coast of Sweden with the Fleet Air Arm, flying a Swordfish L2745, the crew were unable to find their way back to their base ship because of terrible weather conditions. The plane eventually crashed into the sea. The crew of three - Leslie Webber, John Read and Gordon Busby were all killed as were the crews of several other aircraft on the same mission. William James Brookes, Assistant steward. Serving with the Merchant Navy on SS Almeda Star (London). 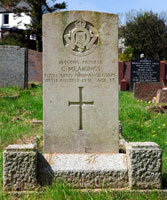 Son of Gordon Grace Mills Brookes and Elizabeth Brookes of Combe Martin. 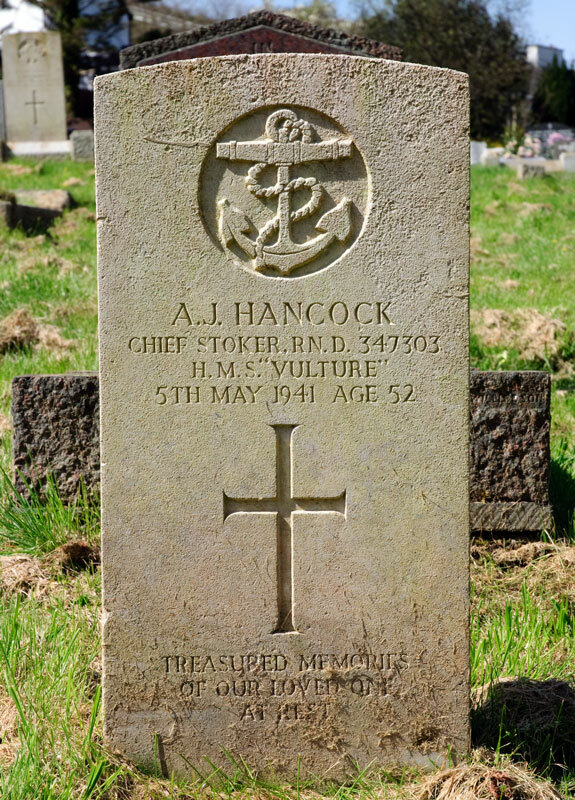 D/347303 Chief Stoker Albert John Hancock of the Royal Navy, HMS Vulture. Son of James and Minnie Hancock; husband of Rosalind Hancock of Combe Martin. Born in Combe Martin in the December Quarter of 1888. Died 5 May 1941 aged 52. Buried in Combe Martin Churchyard. PLY/X18 Corporal Sidney John Parkin of the Royal Marines, HMS Trinidad. Son of Philip and Emily Parkin; husband of Jennie Parkin of Ilfracombe. Born in Combe Martin in the September Quarter of 1911. Died 14 May 1941 aged 33. 7888777 Trooper Alfred Granville Crompton of the 8th Battalion, the Royal Tank Regiment. Son of Granville and Elizabeth Crompton. Born in Combe Martin in the September Quarter of 1918. Died 10 May 1942 aged 23. 7519045 Staff Sergeant John Luxton Bolt of the Royal Army Medical Corps. Son of Charles Bolt. Born in Tavistock in the June Quarter of 1915. Sied 1 January 1944 aged 18. Buried in Combe Martin. P/JX 565172 Ordinary Seaman William Charles Wilcox of the Royal Navy, HMS Shrapnel. Son of Charles Henry and Eliza Wilcox. Born in Combe Martin in the June Quarter of 1925. Died 1 January 1933 aged 18. Buried in Combe Martin churchyard. 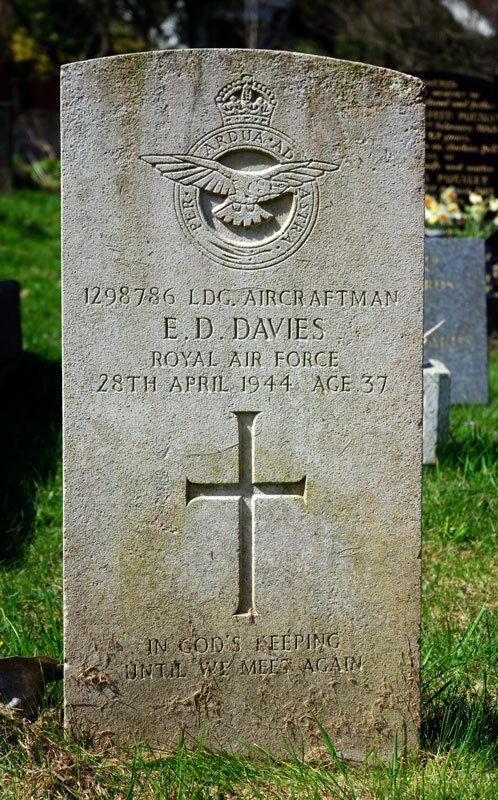 1298786 Leading aircraftman Evan David Davies. Son of Robert and Elizabeth Davies; husband of Hilda May Davies of Combe Martin. Born in Wales in 1907. Died 28 April 1944 aged 37. Buried in Combe Martin churchyard. 5615484 Lance Sergeant Albert James Vinnicombe of the 1st Battalion, the City of London regiment; transferred from the Devonshire Regiment to the Royal Northern Fusiliers then to the City of London. Son of Eva Vinnicombe; husband of Margery Rose Vinnicombe of Combe Martin.. Born in Crediton in the March Quarter of 1911. Died 12 May 1944 aged 33. T/10677702 Driver Richard Frederick Stevens of the Royal Army Service Corps. Son of Ernest and Helen Stevens; husband of Vera Stevens. Born in 1906. Died 13 May 1944 aged 38. Buried in the Combe Martin churchyard. 1384420 Sergeant Pilot Frank Edwin Darch of the RAF VR. Son of Frederick and Jane Darch of Fulham. Born 10 December 1942 aged 21. 5735497 Private Kenneth Maurice Burgess of the 5th Battalion, the Black Watch. Son of Harry and Elizabeth Burgess. Born in Combe Martin in the June Quarter of 1923. Died 11 July 1944 aged 21. 49199 Flight Lieutenant Henry Scholefield of 272 Squadron, RAF VR. Son of Henry and Evelyn Scholefield of Comb Martin. Born in Combe Martin in 1919. Died 28 August 1944 aged 25. 948866 Gunner Richard James Draper of 420 Battery, the Royal Artillery. Husband of Phyllis Draper of Great Yarmouth. Born in Combe Martin in the December Quarter of 1918. Died 12 September 1944 in Burma aged 25. 160133 Flying Officer (pilot) John Neville Rowbotham of the RAF VR, 541 Sqadron, serving as a member of the Rhodesian Air Crew Contingent. 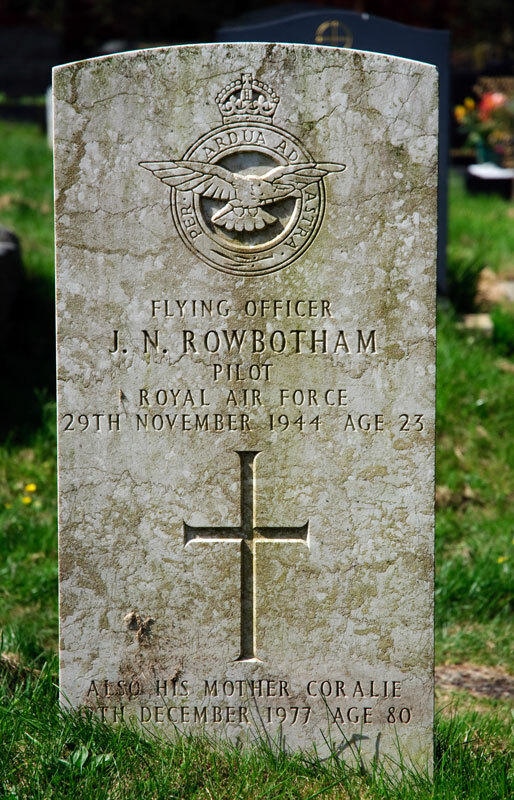 Son of Captain Victor Rowbotham formerly of the Royal Flying Corps and his wife Coralie of Umberleigh, Devon. Born in Rhodesia in 1921. Died 29 November 1944 aged 23. Buried in the Combe Martin churchyard. 14775413 Private William Frederick Laramy of the 1st Battalion, the East Lancs Regiment, transferred from the Devonshire Regiment. Son of William Vivian and Beatrice May Laramy (née Norman). Born in Combe Martin in the March Quarter of 1926. Died 12 April 1945 aged 19. NX73060 Driver John William Parsons of the Australian Infantry Force 2/3 Motor Ambulance Company, Australian Army Service Corps. Son of John and Sarah Ann Parsons; husband of Doris Lovilla Parsons of Broadmeadow, New South Wales, Australia. Born in 1896. Died 12 July 1945 aged 49. 5624888 Private Alfred Norman of the 7th Battalion. the Hampshire Regiment. Son of Martha Ann Norman of Combe Martin. Born in Combe Martin in 1917. Died 6 August 1944 aged 27. 1915212 Sapper Thomas George Comer of the Royal Engineers. Son of George and Bessie Comer; husband of Gladys Doreen Comer of Combe Martin. Born in Combe Martin in 1916. Died 25 December 1946 aged 30. Buried in Combe Martin in the Ebenezer Baptist churchyard. 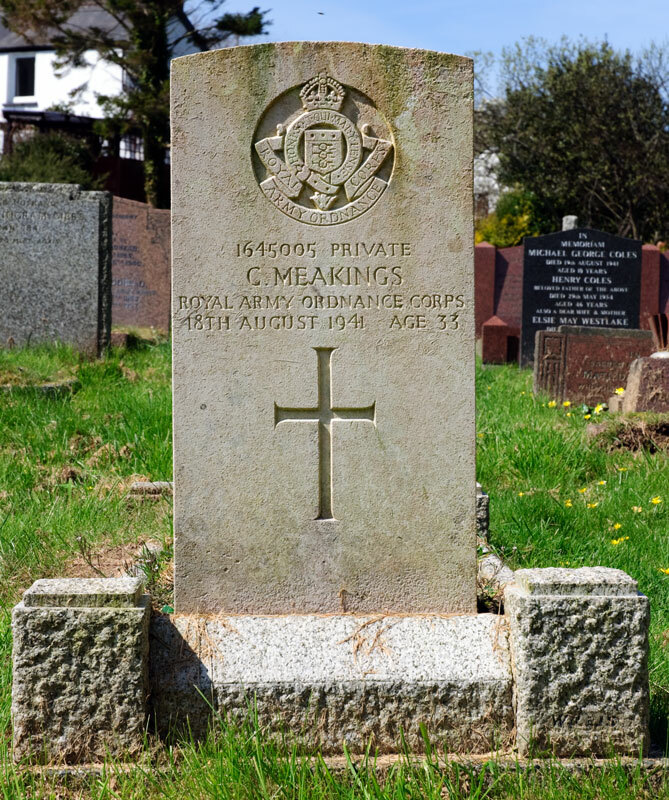 1645005 Private Colin Meakings of the Royal Army Ordnance Corps. Husband of Dora R. Meakings (Née Gill) of Combe Martin. Born in Worcester in 1908. Died 18 August 1941 aged 33.